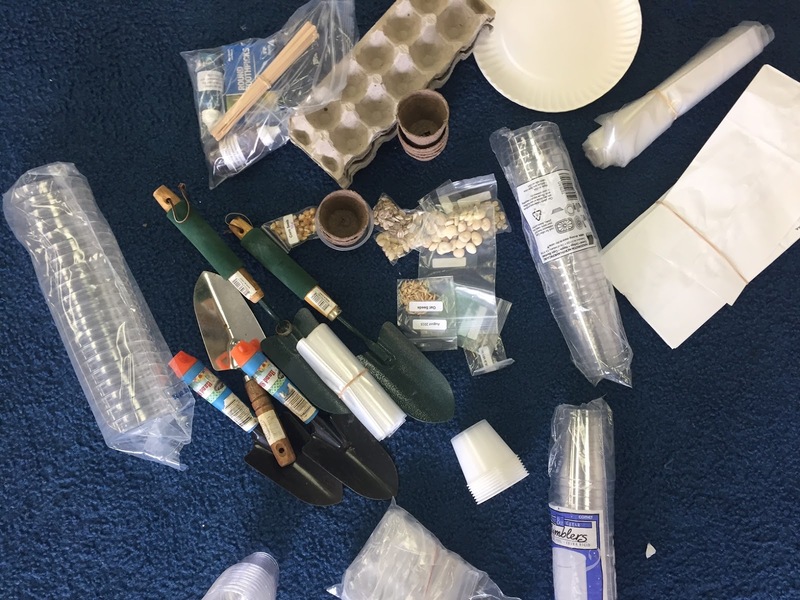 Every April the kindergarten plant kit arrives from the science department. 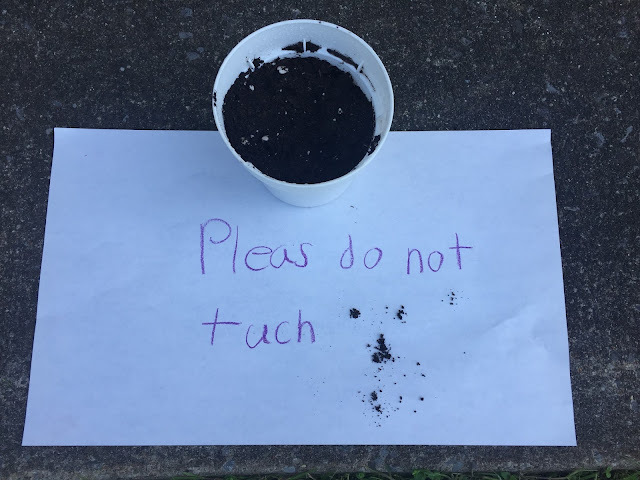 The plant unit includes traditional lessons, but I wanted to use a more inquiry-based approach, so here's what I tried. I placed the plant kit in the center of the carpet and gathered the children around it. Then, I said, "Look what came today! I wonder what is inside?" Then, I opened the box, took out each object, and asked, "What is this called?" 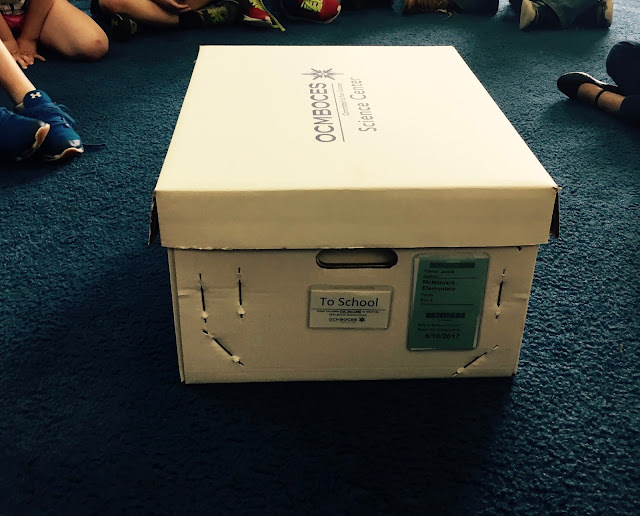 Once all of the items were revealed and named, I asked the children, "How do these items go together? What do you think we are supposed to do with them?" When we listed dirt AND soil, I asked if they were the same. Most of the children said, "Yes," so I took note that this might be a great question to research. There was also some discussion of how plants get sun that included talk of putting the plants indoors and outdoors. I noted that this might be an experiment we could do to further explore the best growing conditions. So in that first exploration, we did some predicting, vocabulary development, classifying and listing. 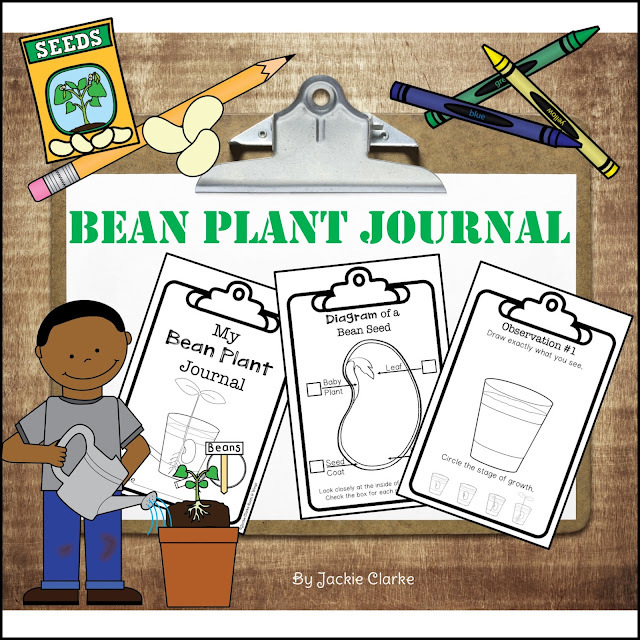 I also was able to determine what they already knew about what plants needed to grow and to identify two questions for research and experimentation. We were off and running! I integrated our plant unit, with our procedural writing unit. 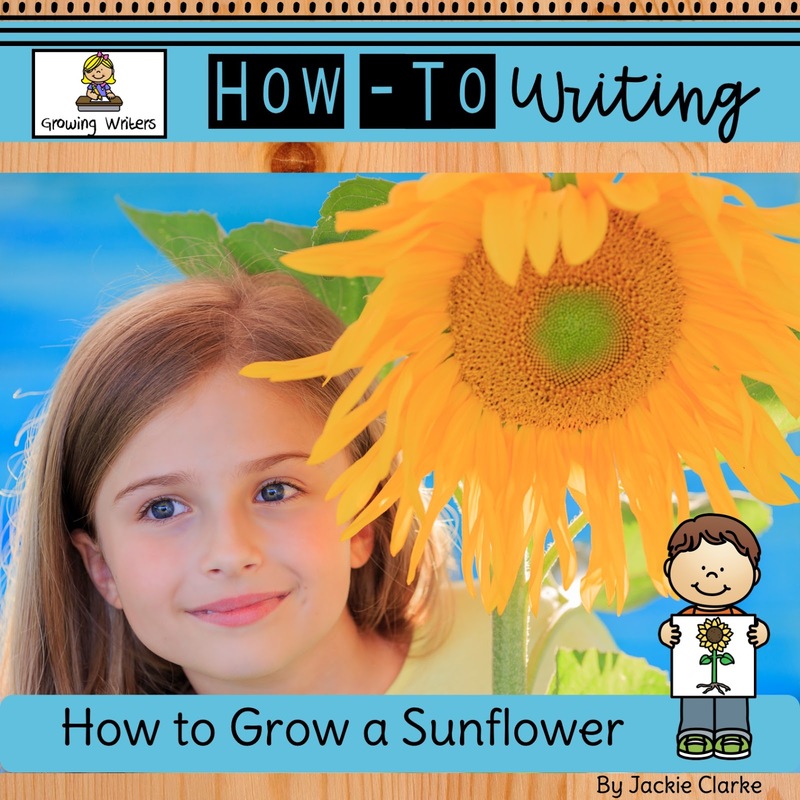 I usually begin this unit by co-creating a How-To book with the children to provide them with a model, before they go off and write one independently. So together we each created a How to Plant a Seed Book and then later that day followed the steps to plant our seeds. Following the planting, I asked, "Who will help me take care of these seeds?" Luckily, the response wasn't, "Not I!" This began a conversation about whose job it would be to take care of the plants. 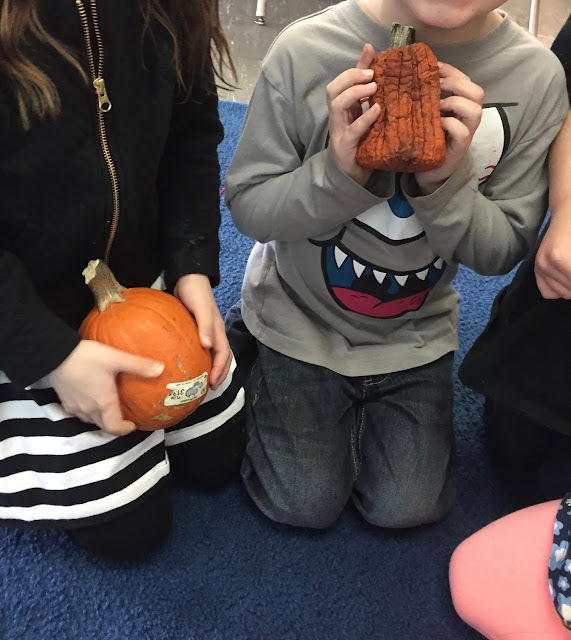 We talked about what it meant to be responsible (one of our social studies key concepts) and what that looked like when caring for a plant. We read The Carrot Seed by Ruth Krauss and Jasper's Beanstalk by Nick Butterworth and examined each character's responsibility to his plant. We then identified good times for watering and explored solutions for days we were absent or school was closed. 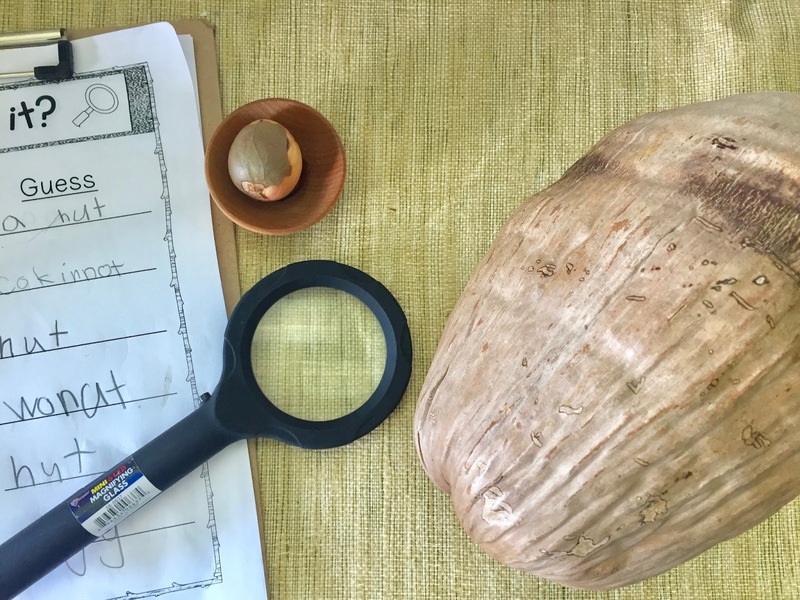 I brought in a couple of "mystery objects" and asked children to guess what they were (avocado and coconut seeds). None of the children guessed correctly and many thought they were nuts which led us to a discussion about the difference between nuts and seeds. 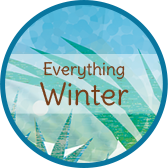 The coconut is actually a fruit, nut and seed! When we returned from a Memorial Day weekend, many of the plants had sprouted! They were very excited and a crowd gathered at the window. Over the next few days, I sent some plants home to be transplanted outdoors. When we were left with many "sproutless" pots, I gathered the children together and talked about how their plants were doing. They shared their successes and failures and gave reasons why their plants didn't sprout. Most believed it was due to too much or too little water. I suggested that the "fun" of the spray bottle may have played a part in their plants getting too much water and many agreed that they may have given a few too many "squirts!" So we revisted the term "responsibility" and how they had been charged to take care of a living thing. I asked if any would like to try again and learn from their first experience. Several of them took me up on this and planted a new seed. Other plant "tragedies" led to learning experiences too - mostly with how plants must be handled with care! The children were very engaged in caring for their plants right up until our last days of school. 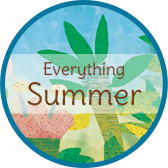 It was messy with dirt spills and overcrowding and stuff other than plants being sprayed, but they were learning about taking turns, and patience, and living things. With one day left of school, a little girl said, "I didn't get a plant." I asked her why she thought that was and she said, "I overflowed it." She was taking personal responsibility for this. She was learning through failure. We talked about what she might do differently next time and I sent her home with a packet of seeds. I must confess that there have been many years where the children planted seeds and I took care of them. Where was the learning in that? I realize now all that they had missed. 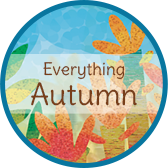 I taught "about" plants through read alouds, worksheets, and booklets rather than allowing experience to be our teacher. 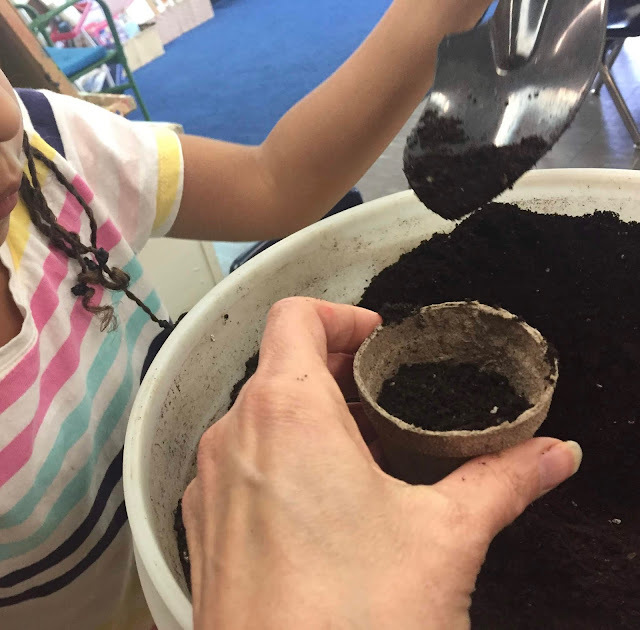 To explore the question, "Do plants grow better inside or outside, we took identical seeds, pots and soil and placed one inside and one outside. The children made a prediction and gave a reason why. Two days later the outside pot was missing. The children thought it must be the animals that took it because they couldn't read the note! So we set it up again and got some surprising results. The inside plant didn't sprout at all, while the outside plant was thriving. We reviewed what was the same about the two plants (the pots, the seeds, the soil) and what was different (the amount of sun and water). The children wondered why some of them were able to grow a bean plant inside while this one did not sprout at all. 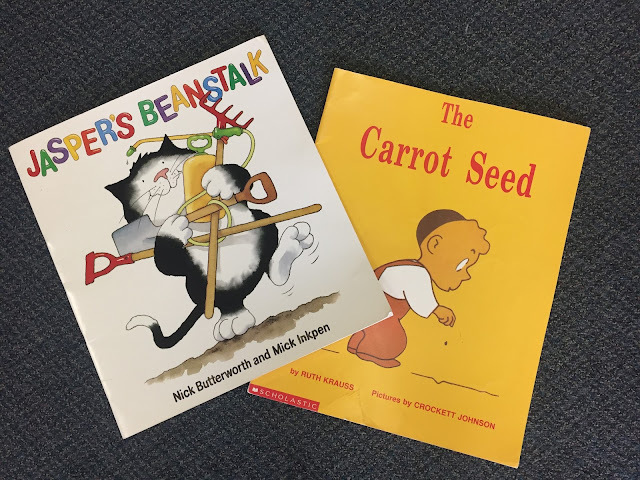 We read The Empty Pot by Demi and the children realized that not all seeds were exactly the same and that there might be some seeds that just won't sprout. What I liked about this experiment is that it expanded children's thinking beyond what plants need to grow into some beginning work with variables. 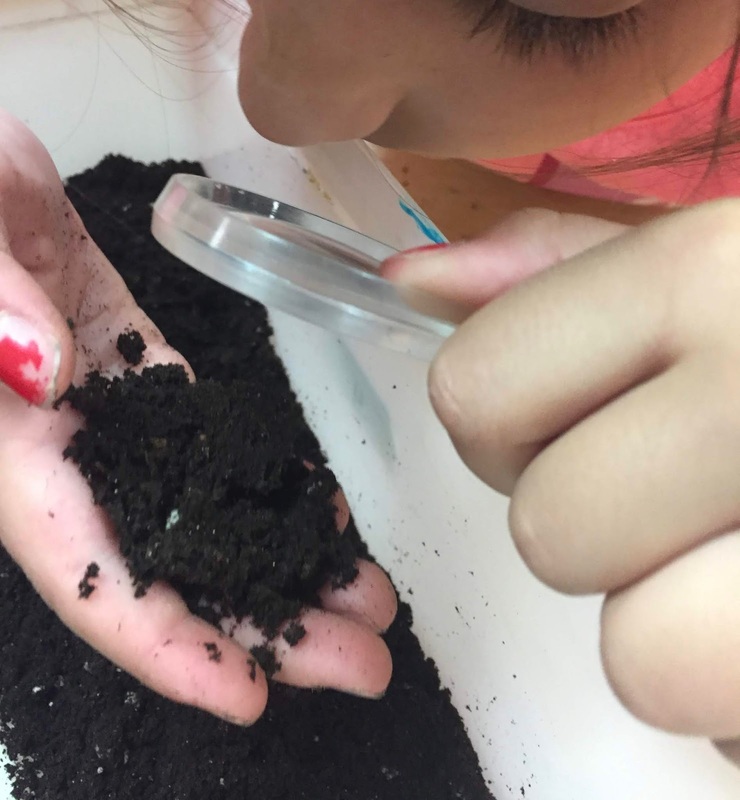 We began our research of dirt vs. soil by reading Dirt: The Scoop on Soil by Natalie M. Rosinksy and Soil Basics by Mari Schuh. In the first book it said, "Dirt is another word for soil." Yet in a video we watched the gardener differentiated between the two and stated that "dirt is what you find under your fingernails, while soil is what is used for planting." So I gave them some dirt/soil to explore to see what they could find out. They described it as cold, tickly, soft, smooth, squishy, dark, black, and brown. They also discovered grass, leaves, sticks, roots, and "white stuff" in the mix. We then compared dictionary definitions of the words. One big difference was that soil contained a mixture of organic remains such as clay and rock particles, while dirt did not. I started to think it was a little like soup where you have the broth, that some might consider to be soup, and then you have soup that includes vegetables, meat, noodles, etc. This seemed to help them understand it all a little better. We then went back to what we had used to plant our seeds and I asked "Is this dirt or soil?" 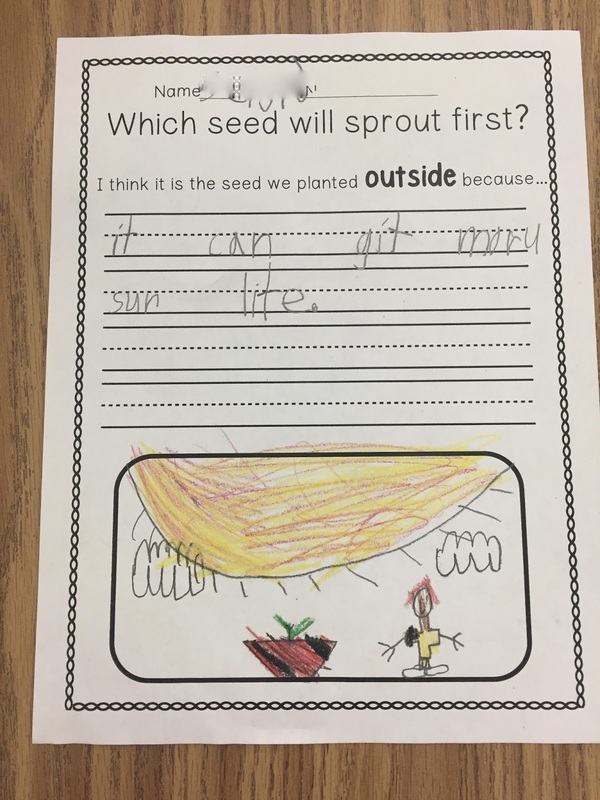 They all agreed that it was soil because they had found other "stuff" in it and we talked about how this "stuff" provided food or nutrients for growing plants. At this point our work with dirt and soil began to merge with another project that had been ongoing for most of the year. You can read more about the Pumpkin Project here! Upon Reflection, I learned a lot through this project as I compared it to the way in which I'd previously taught our plant unit. It felt simpler, more authentic, and responsive to what children understood and misunderstood about plants. Opportunities for research and experimentation unfolded naturally from children's thoughts, ideas, and misconceptions. 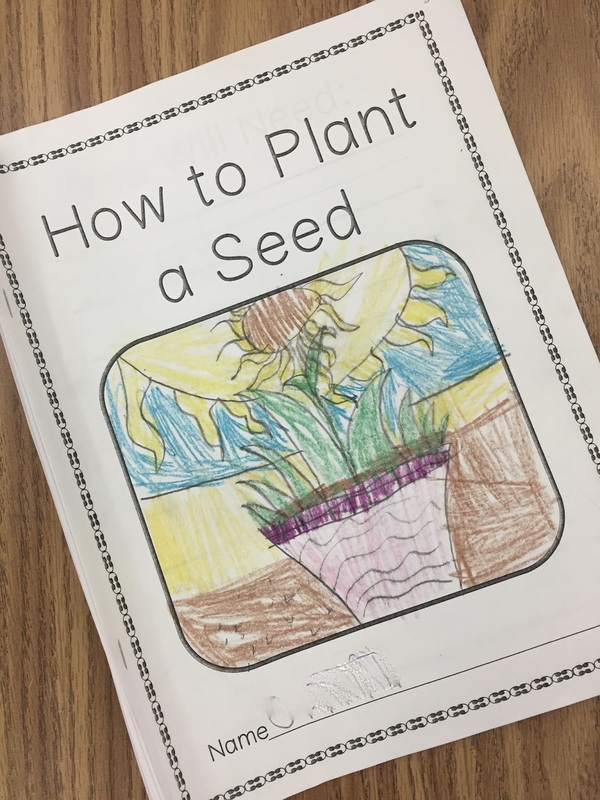 It allowed us to go deeper into the content than the traditional lessons as many children had experiences with plant basics in preschool. Also, learning about plants didn't just happen from 2:30-3:00 during a science block. Noticings and wonderings happened throughout the day as is the way with project work. If there is anything I would change about this project, it might be to start a little earlier to give us more growing time (the kit arrived in April, but we didn't begin until May). 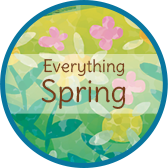 We could easily begin in March and continue learning about plants throughout the spring. 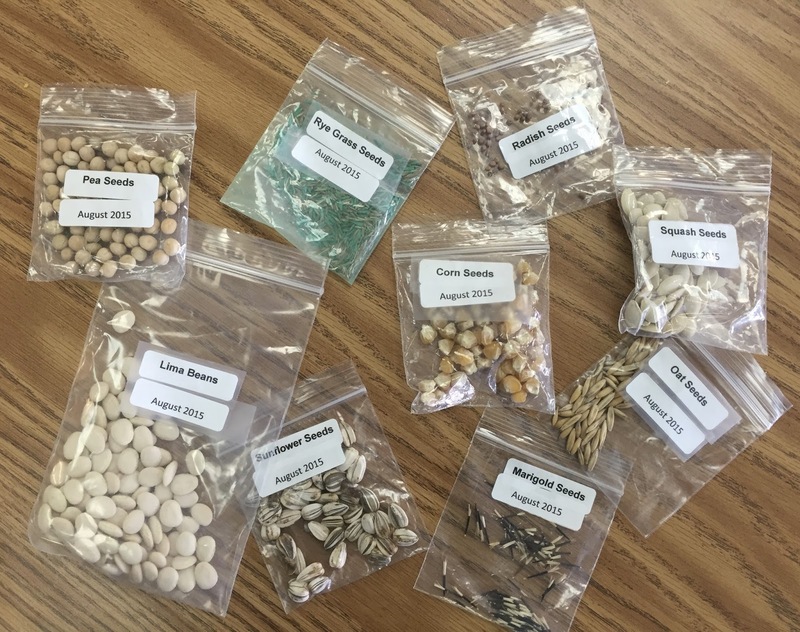 I would also eliminate a few of the seed choices as some brought better learning opportunities than others (beans vs. grass) and a bigger WOW factor in the children's eyes. If you are beginning in inquiry, plants might be a good place to start. Give it a try and let me know how it goes!